Discussion in 'Breaking and Major News about Scientology' started by Karen#1, Jul 13, 2017. The rah rah is meaningless...2 Emmy Awards in the works..
Too excited to write much. Going to bounce around the living room to celebrate. Take that you bullying cult! No one loves you. No one listens to your lies any more. We, the former scientologists, stand tall and proud. We have a voice and we are using it. 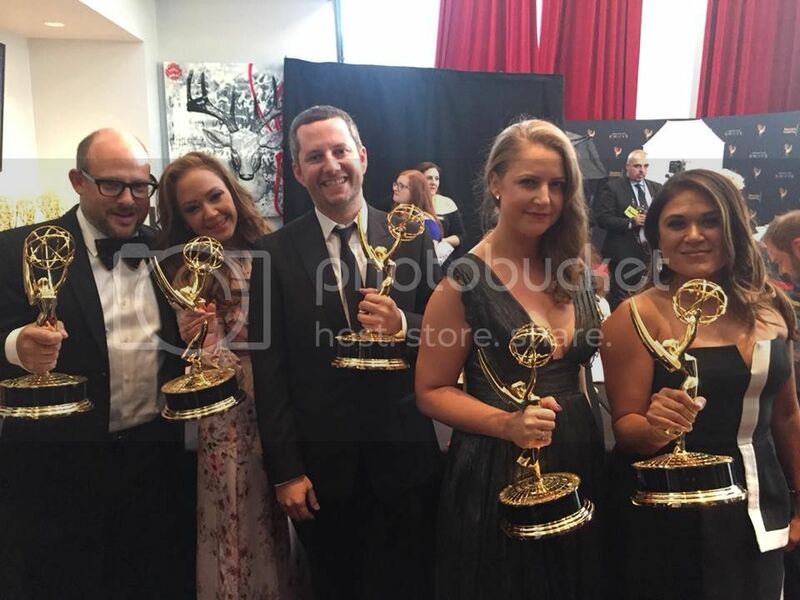 Two well deserved EMMY nominations for the "AFTERMATH" series and all its dramatically revealing content! Congratulations to Leah, Mike and all the producers/participants in such a brilliant show. They pulled it in . . .
Leah Remini and her team are awesome! Big hugs and thanks to everyone who participated! When I met up with all those exes in LA a few weeks ago, I was astounded to find out each and every person there personally knew about a dozen or more individual people from their personal lives who were "out" but under the radar so still in good status with the toxic, racketeering cult! 80 x 12 x (12 x 12....) = a whole shitload of people who are out that COS thinks are IN! So from LoneStar's blog it seems the few diehards that are left are getting incredibly intense and fanatical. That's gonna blow up a hundred ways to Sunday, like some sort of cognitive dissonance implosion. Those sorts of people only push others away. Bad experiences may be forgotten in time, but the lessons learned so we don't repeat those bad experiences stay with us, and when trust is gone, it's gone. Soon all those borderline people who are just pretending they're in COS will find out just how many of them there are, and they'll be watching Leah's shows and discussing their mutual experiences and helping those who are left get out and keeping others from getting caught up in the scam. Go Leah and team! My guess has always been that well over half of "ex's" live under the radar. I won't get into my fairly lengthy analysis of why I think this. In my opinion the ex's that speak out are the minority of those that have "left". It is pressure cooker situation. Imo this is one of the reasons the cult is going so hard after those that have been involved in the production of Leah Remini's show. The cult has to find a way to denigrate and discard the film(s) in a desperate attempt to retain some control. Obviously in the 21st century internet age it is impossible to get the pony back behind the fence. The cult has lost control. The ex's, the critics, have in effect taken control of the public opinion of the cult of scientology. CONGRATULATIONS to Leah, Mike and every single person who has worked so hard. From my heart, thank you! You may never really know how very much it means to so many of us. How are your videos doing Marty? Got any awards yet? And wonderfully well deserved attention on the crimes of the cult! Oh yes, PS: LOVELY, lovely photo of Leah and Mike . . . absolutely wonderful/. 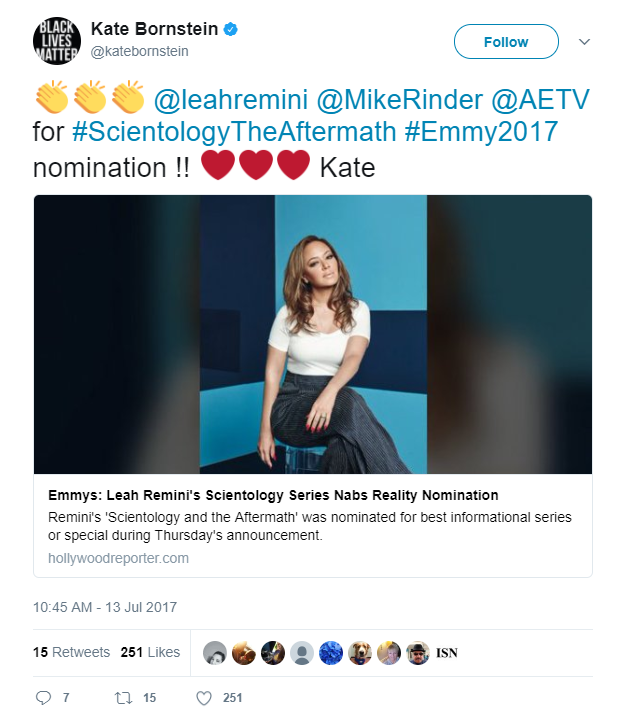 Kate Bornstein, author of A Queer and Pleasant Danger, congratulates Leah Remini and Mike Rinder on their Emmy nomination. And that's not even with my :" Confessions of a true prick"
Scieno-Scenario: An OT VIII driving to the org (listening to radio) quite accidentally hears the news that Leah's A&E show just received two (2) Emmy nominations! Naturally, the entheta of that moment is so severe they begin to rollercoaster, get sick and lose all their case gain. By the time they get to the org, they are so thoroughly enturbulated that they stumble out of their car and sprain an ankle--more proof that they have encountered a bona fide SP! The limping injury makes them late for course roll call and thus they are immediately routed to the Ethics Department for handling. even listening to Black PR on the radio in the first place!? broke away to the news. I had no idea! you had no idea. Ron says a thetan knows everything. a look at your out-irresponsibility for not r-factoring me! for an hour straight each week! then they do all the talking. and a massive amends project! Whutttt? What did I do now? Out KSW! Altering the tech!! of blank paper they will need for their success story. Scieno-Scenario: An OT VIII driving to the org (listening to radio) quite accidentally hears the news that Leah's A&E show just received two (2) Emmy nominations! Naturally, the entheta of that moment is so severe they begin to rollercoaster, get sick and lose all their case gain. By the time they get to the org, they are so thoroughly enturbulated that they stumble out of their car and sprain an ankle--more proof that they have encountered a bona fide SP! The injury makes them late for course roll call and thus they are immediately routed to the Ethics Department for handling. If case gain is believing the ideas that scientology puts into your head, I can see why you aren't supposed to read anything but hubbard. 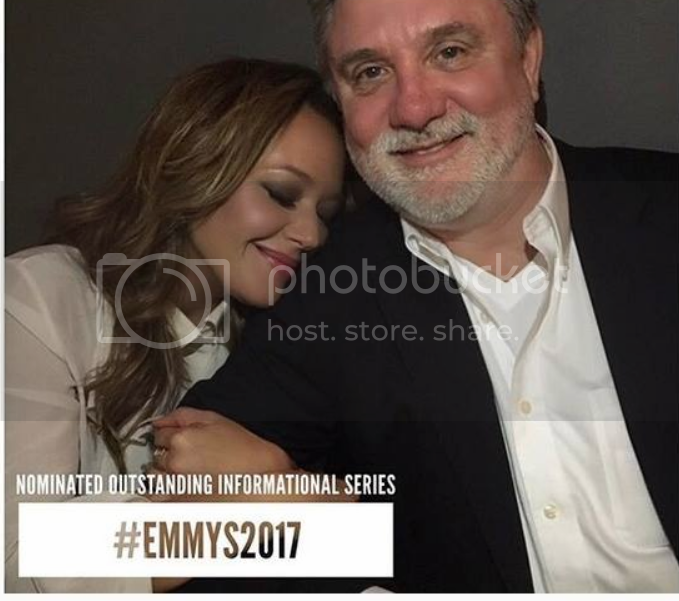 You all probably know by now.....Leah Remini Docuseries Scientology and the Aftermath receives an Emmy Nomination. People are paying attention...Congratulations Leah. Leah's show not only lasted a FULL season & got TWO Emmy nominations but also got a SECOND season. Poor dm, the little man has to be busting a gasket over this ! The days of X's hiding in the dark are long gone ! These days X's speak out while when those "in" ? They hide ! Leah won the Emmy tonight !